It has become increasingly popular to install Mazda MX5 MK1 seats in early British sports cars. (MX5 is also called the Mazda Miata in some markets). The seats offer a compact and stylish design with a modern level of comfort and adjustment. They provide increased amounts of lateral support and their design also features an ‘anti- submarine seat base which prevents you from sliding forward in the event of a crash. As you would expect, the Mazda MX5 (Miata) seats can be used to great effect in the Jaguar E-Type and, when trimmed to match the cars interior, they blend in beautifully. Their improved design make those long journeys or spirited cornering so much more enjoyable. The Fosseway Performance E-Type Mazda MX5 seat adapter kit is designed to make the installation of the Mazda seats straightforward. 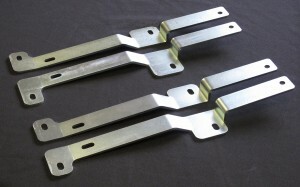 The brackets allow the use of the original Jaguar seat runners and no modification to the car or runners is required. The kit is compatible with the Mazda MX5 MK1 seats and all Jaguar E-Types excluding the fixed back seats used in the Series 1 3.8. Each kit contains four, unique adapter brackets (designed to fit the individual requirements each of seat runner location) to give a trouble free installation. The brackets are laser cut and CNC folded for accuracy and are bright zinc coated to avoid corrosion.